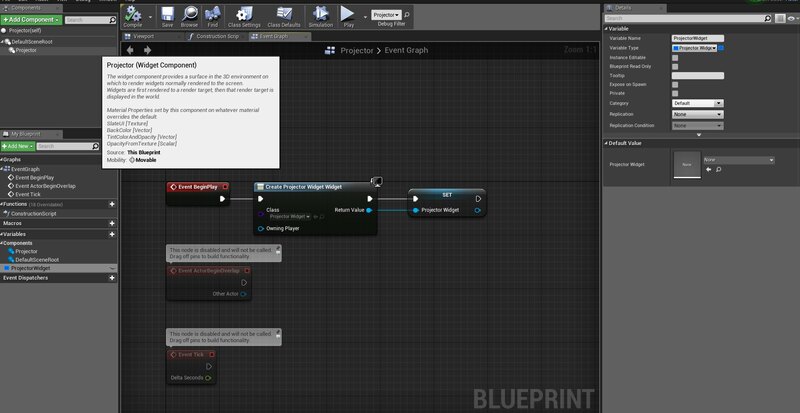 I have Blueprint Class which contains a Widget Blueprint (so I can spawn it into the world, like widket in 3D space), and that Widget Blueprint have some Text components, for example with name "Name", how can I access that Text component Name through Blueprint Class? Because I want to change text in Widget Blueprint through Blueprint Class. Yes Widget component which contains Text component. Widget Component can't contain a Text Component, which is added in the menu you see in the image above. You must mean a Text Widget, right? Have a look at SenToRious' answer. That's precisely how you access a normal widget embedded in a widget component. Do this in your actor. As you can see I cast to Projector (Blueprint Class which contains Widget Blueprint) and then I access variable ProjectorWidget (I Promoted it to Variable as you said) and from that reference I cannot access any Text inside Widget Blueprint. It should change text, but it doesn't, there is still default text :/ without changes. Embedded is just the name of my widget, your widget is called Projector Widget. Also, you cannot cast while dragging Execution wires (the white ones), use the data wires, they are context sensitive and will give you a sensible range of choices. 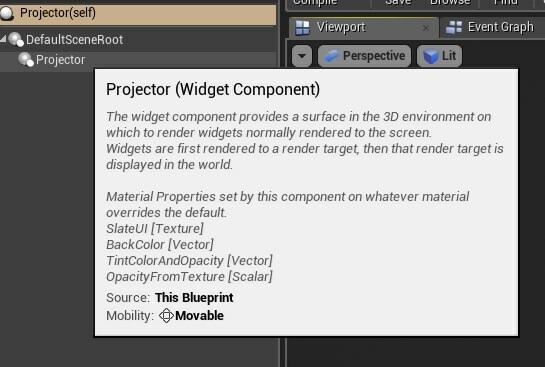 You're trying to cast to a widget (ProjectorWidget), cast to a widget component instead (Projector). Take a closer look at the image I posted, especially at the comments. It seems you're not following it right. You're trying to cast by dragging the white wire while you should be Getting User Widget Object first. One note, this will not work in the Construction Script. Thank you that Get User Widget Object works, but I still cannot cast to embedded widget, no option for it. 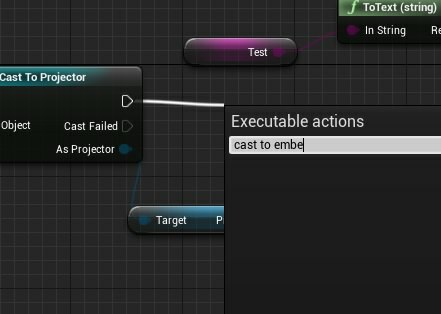 Follow this, instead of Embedded, cast to Projector Widget instead. You should mark this as answered so others can find it easily. 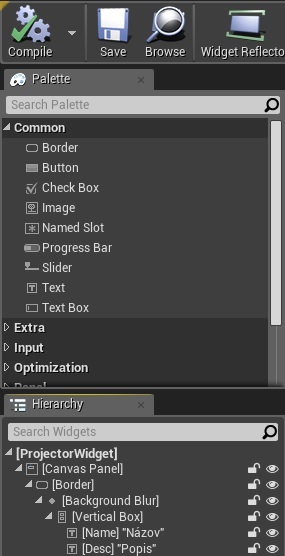 If you're using the WidgetComponent you can get the widget and cast it to your WidgetBlueprint class then you can access whatever you want. I see, drag from the Array Element and Cast to the Blueprint class that has the widget, and you should have access to that widget. @SenToRious please check my comment answer to @Everynone because it is quite long. If you combine my first answer with your reply on @Everynone answer, you'll have your answer. Drag a pin from your ProjectorWidget (you got it from Cast to Projector) and call Get User Widget Object then cast the result to the widget inside of the ProjectorWidget (similar to my image) and now you should have the ability to use that widget class.